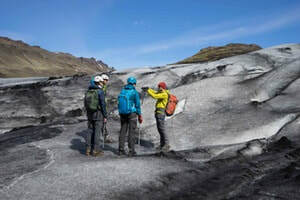 ​Join us on a truly adventurous ride across the fascinating highland of Iceland on the historical Kjölur route along huge glaciers and through lava fields! 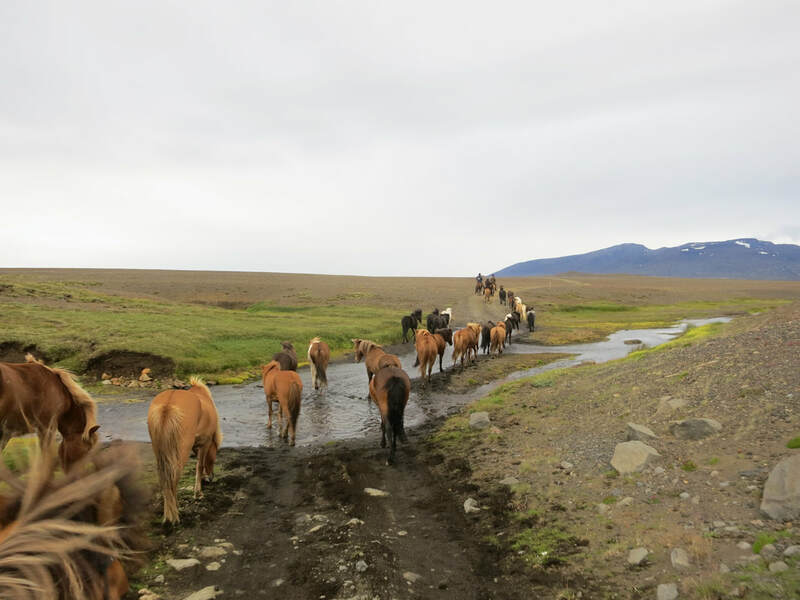 We travel with a small group in the traditional style with a large herd of free running horses and stay overnight in rustic mountain huts. Visit the Golden Waterfull Gullfoss, the breathtaking Brúarhlöð canyon and the hot springs of the Geysir and Hveravellir area. Follow the footsteps of the ancient Icelanders at Thingvellir Parliament place and relax in the geothermal natural bath of the Secret Lagoon. 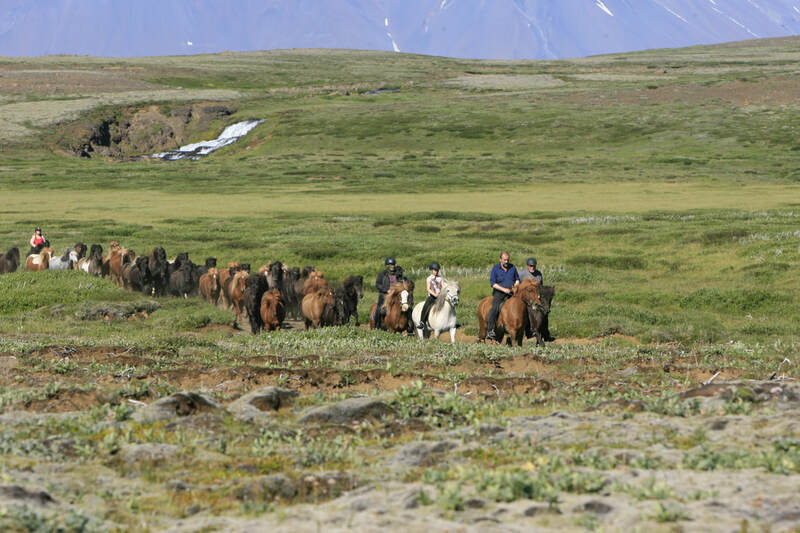 During this tour you will cross several glacial rivers on horseback, ride along narrow trails through vast lava fields only accessible to horses and will feel the indescribable freedom of the highlands! 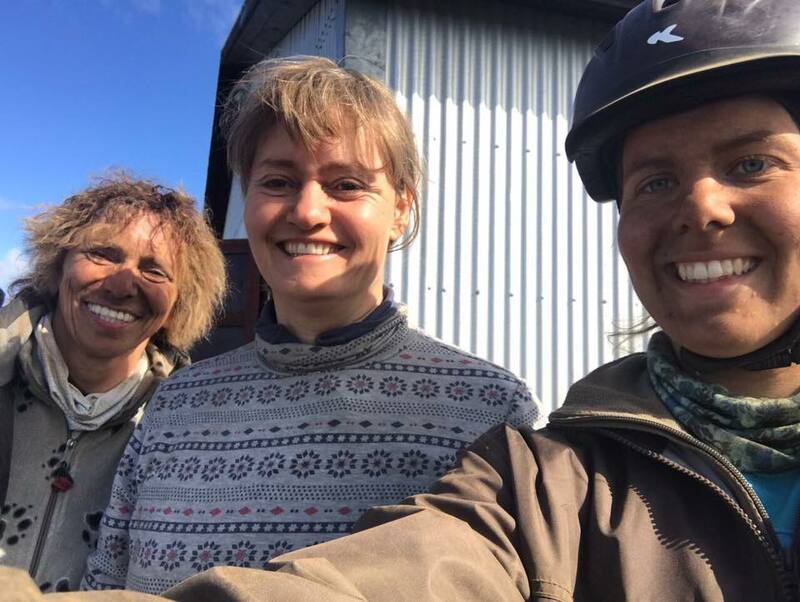 ​On this tour we will travel with our wonderful warmhearted hosts Hjalti and Ása from Kjóastaðir farm who know this part of the highland better than anybody else. Look forward to home- made food with love and wonderful singing in the evening! 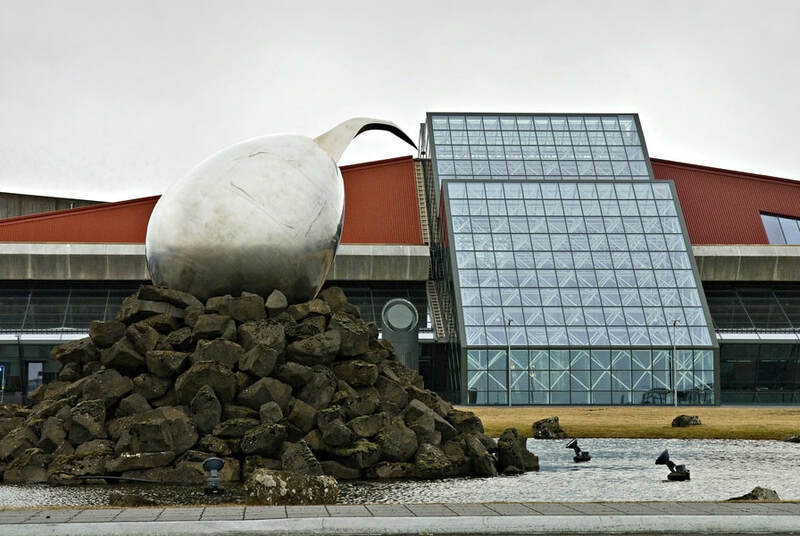 The food provenance is mainly sourced from local family farms and the ultra fresh vegetables come from nearby Flúðir area where the greenhouses are heated with geothermal energy. This tour is only recommended for experienced riders that are capable and happy to ride for up to 6-7 hours/50 km a day. 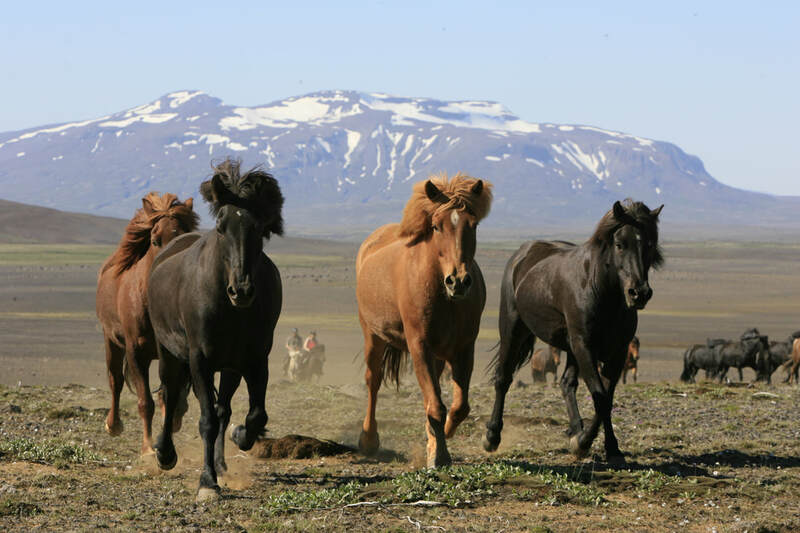 You should feel comfortable riding in all gaits over rough terrain and be willing to follow the speed of the free running herd. Area: Across the highland between the huge glaciers Langjökull and Hofsjökull. Accommodation: Mainly in sleeping bag accommodation in rustic mountain huts. Accommodation in Reykjavik not included but can be arranged. Included: Geothermal Natural baths Secret Lagoon & Hveravellir hot pool. Pick up at your accommodation in Reykjavik at around 8 am. We drive to Thingvellir Nationalpark, situated right on top of the midatlantic ridge and a heaven for everybody interested in geology and history. We can clearly see the landrop caused by the plates drifting apart. At Thingvellir, the ancient parliament, was founded and our guide will take you to all the major points of interest and tell you about the amazing judical system of the past. We continue by bus to the magical geothermal Haukadalur area with its hots springs and erupting geysirs and to the Golden Waterfall Gullfoss. 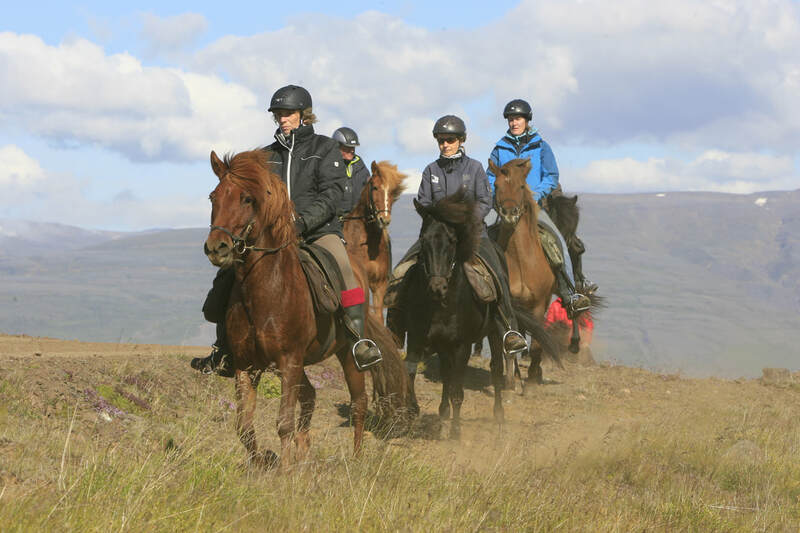 At Kjóastaðir farm we enjoy a light lunch and introduction to the Icelandic horse, its tack and the special gait tölt before heading off to our first ride to Brúarhlöð canyon and the beautiful valley Tungufellsdalur. After the ride we enjoy a bath in the Secret Lagoon, a natural bathing hot spring before returning to Kjóastaðir farm for a wonderful home made meal in the cozy dining room. After a plentiful breakfast we fix our lunch from the buffet and head towards the horses. Today we leave the farming countryside and head up to the highlands. Now we leave civilization behind and ride only through uninhabited areas for the next days. Only sheep and polar foxes will greet us during the day. During the ride we enjoy views of the huge Bláfell mountain (1204m), a distinctive, flat-topped, steep-sided volcano formed when lava erupts through a glacier or ice sheet. These types of volcanoes are very rare, being confined to regions which were covered by glaciers and had active volcanism during the same period. The giant Bergþór used to live in Bláfell mountain, look forward to his lovely tale! We continue our ride with beautiful views of Kerlingarfjöll mountain range to the east and Langjökull glacier to the west before crossing the river Jökulfall. Whereas the first part of the ride will be through a fascinating desert like area we enjoy soft trails through green meadows along the river Svartá during the afternoon towards our hut. Truly a day of variations in landscape and topography! Riding distance: ca. 22 km. Today is going to be a long riding day with breathtaking scenery when we ride from our hut to Kerlingafjöll geothermal area situated right in between the glaciers Langjökull and Hofsjökull. Accommodation Kerlingafjöll: Cozy mountain hut. Inside toilet. Bunk beds in two rooms. 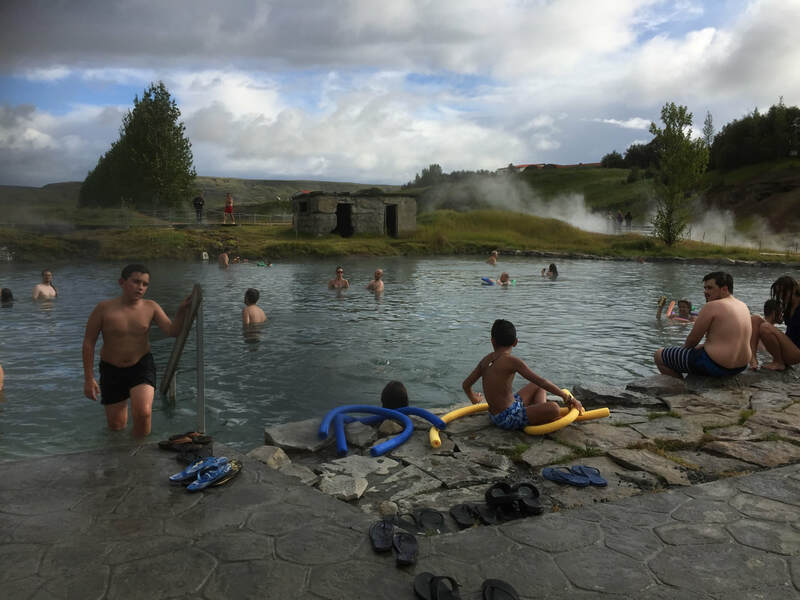 After breakfast make your picnic lunch from the buffet and enjoy another bath in the geothermal pool until it is time to leave with the highland bus to Reykjavík at noon. Arrival in Reykjavik bus terminal in the afternoon. 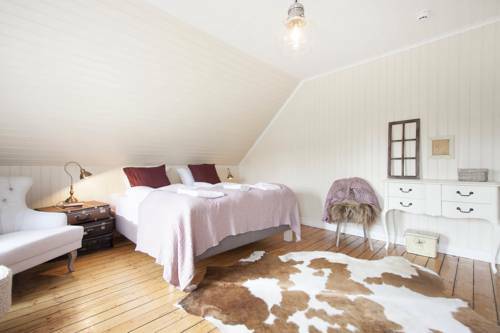 Please note that the accommodation in Reykjavík is not included but we are more than happy to arrange it for you!